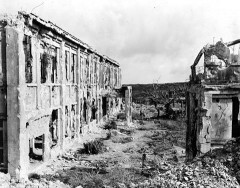 ＜A photograph acquired after World War II＞ Dilapidated buildings of the First Okinawa Prefectural Middle School (now Shuri High School) straight after the war, with the surrounding greenery burned away. On April 8, the Ryukyu America Historical Research Society acquired 151 photographs of scenes in Okinawa during the period from directly after World War II to the 1960s. The collection includes photographs of people and scenery all over Okinawa from its northern area, including Ogimi to the southern area, including Itoman. A sequence of photographs gives us a view of the dilapidated buildings of the first Okinawa Prefectural Junior High School, a savvy dealer selling an Okinawan farmer’s kuba hat to a U.S. soldier, and scenery of Itoman, which in those days was then crowded with houses with tiled roofs that had somehow survived having been exposed to fierce naval bombardment. A man selling a kuba hat to a U.S. soldier. These photographs are scheduled to be displayed at an exhibition titled Mayaga, Tayaga, Nuyaga (Where, Who and What?) to mark the 40th anniversary of Okinawa’s reversion to Japanese sovereignty. The exhibition is hosted by Kitanakagusuku Village and co-hosted by the Ryukyu Shimpo, and will be held at the Kitanakagusuku Village Central Community Center from May 12 to 15. The photographs belong to Donn Cuson who was stationed in Okinawa as a U.S. Army soldier in the 1960s and currently resides in Arizona. 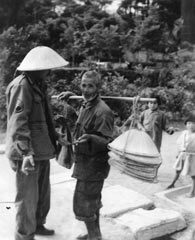 Cuson has many photographs related to Okinawa taken in the period from the end of the war to the time of the reversion to Japan and he has cooperated to provide these photographs. The exhibition will display about 1000 photographs in addition to those provided by Cuson. It will explain the historical background by displaying photographs of people and geography on a large-screen television. 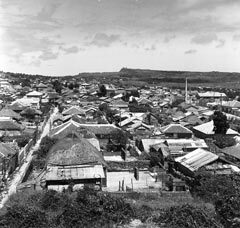 Scenery of then Itoman Town, which was skillfully reconstructed and crowded with many houses during the 1950s despite being exposed to the “Typhoon of Steel” that was the fierce naval bombardment during the Battle of Okinawa. All three photographs were provided by the Ryukyu America Historical Research Society. Kishaba calls for people who experienced the war and know about the history and culture of Okinawa to volunteer to help explain the photographs at the exhibition. About five people are needed. For further details, call Ryukyu Shimpo at 098 (865) 5200 on weekdays.